Do you have problems getting accurate half-square triangles? I’ve found a tool that really helps me to get precise half-square triangles. Let me tell you about it. There are various methods to make a half-square triangle and I’ve tried just about every one – and still wasn’t pleased with the results. I love the look of half-square triangle designs, but didn’t like my results when I used them in my projects. I’ve finally found the perfect tool to give me accurate half-square triangles every time: the Tucker Trimmer. The Tucker Trimmer by Studio 180 Design is an acrylic tool that comes in several sizes but the one I use the most is the Tucker Trimmer 1. You can make half-square triangles from 1” to 6” with this particular size of the Tucker Trimmer. Since I usually make small half-square triangles, this size works well for me. The Tucker Trimmers can be used by right and left handed quilters and instructions are given for both. You can make half-square triangles in whole number sizes (1”, 2”, etc.) or in fractions (1½”, 2½”, etc.). I like it when a tool can be used for a variety of sizes as this makes it very practical and eliminates the need for purchasing a tool for every size. The idea behind the Tucker Trimmers is that you make a half-square triangle a little bit bigger than you want the actual size to be and then you trim it down to the desired size. For example, if I want a 2½” half-square triangle, I might be starting out with one that is 2¾”. Yes, you will be cutting a little bit off each side, but this is how you get that super precise half-square triangle that will make such a difference in your project. To see exactly how to use the Tucker Trimmer 1, click on the image below. 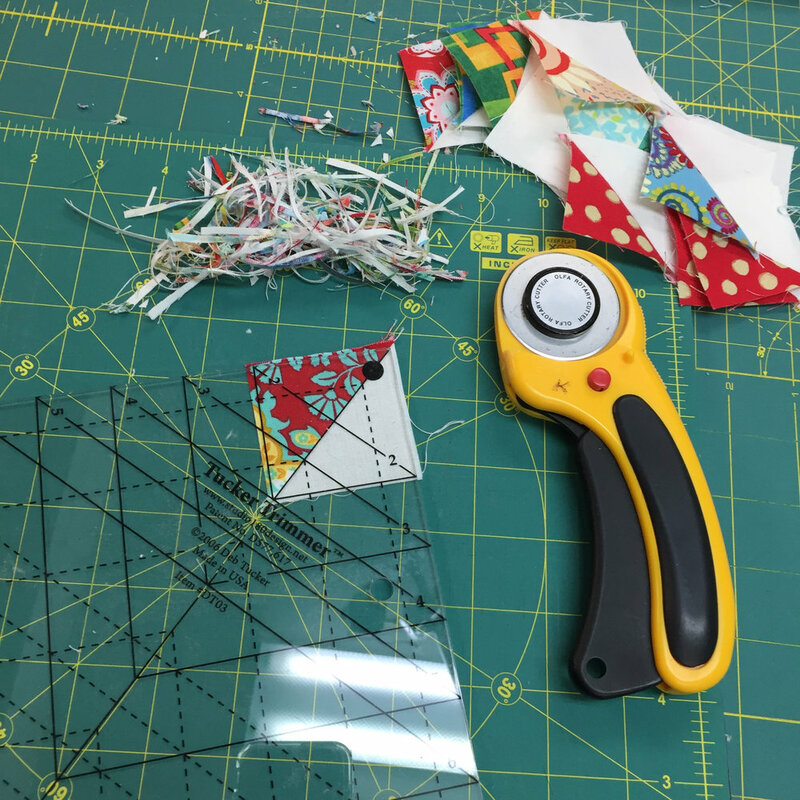 Have you ever used one of the Tucker Trimmers to make your half-square triangles? Let me know your perfect method for creating half-square triangles in the Comments below. 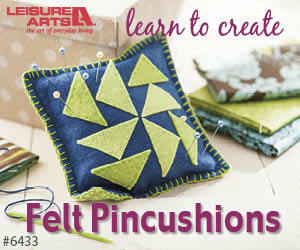 Do you want to enhance your quilting and become the best quilter you can be? If you answered “yes” to this question, you need to join The Quilter’s Way. The Quilter’s Way is the only quilting membership site that includes both training and an active, supportive online community. Don’t wait another day! Join now. I'm working on an hourglass unit. These little units are created from half-square triangles. You'll get two hourglass units from two half-square triangles. Hourglass units are versatile and I'm sure you'll find lots of uses for them in your quilts.